Everyday Fray: From A&K: Giveaway Day! Twice a year Sew Mama Sew hosts a giveaway day of epic proportions, and twice a year we both look forward to a week of discovering and exploring new blogs. Today we figured it was high time to join in all the excitement by hosting a giveaway.... with two opportunities to win! Leave a comment telling us where you get your crafty inspiration from. For a second entry, leave a separate comment telling us how you follow our blog. For a third entry, share this giveaway on Instagram using #everydayfraygiveaway and then leave a separate comment here telling us you shared. The contest will stay open for 1 week (closing at 11:59 pm MST on Sunday May 18, 2014). The winners will be posted on our blog on Monday May 19th, 2014. Love Indian Summer and I only have a few prints! I get my inspiration from awesome blogs and sometimes from the Fabric itself, in fact the quilt I am working on right now has the animal Indian summer print and it is based around that print! I get my crafty inspiration mainly online from my favourite blogs & also on Instagram, Pinterest & Flickr. Thanks for the lovely giveaway. I follow your blog via email subscription, thanks. I get my crafty inspiration from all sorts if places but lots of it definitely comes from all the wonderful talented sewing bloggers out there! Thanks for chance to win - I absolutely love this line! I get loads of inspiration online, from Flickr, IG and blogs. I love reading quilty books and magazines too. I get inspiration from Pinterest, blogs and everyday objects! Lovely giveaway! I still love reading blogs even though IG is more immediate! And I follow on bloglovin'! I get my inspiration from my students and from reading lots of blogs. I'm inspired by super bogs and Pinterest and IG. They each are good in different ways. I also love to just look at patterns around me, like in the cobblestones, or tin roofs or even packaging! I follow you by email and IG! I get my inspiration from the people around me. I always get my inspiration from design seeds.com, ceramic makers, and instagram of course. Yummy giveaway! I get my crafty inspiration from all kinds of places: blogs, Instagram, thinking "I could make that!" at Target, Pinterest (of course). Thanks for the awesome giveaways! I follow you guys with Feedly. Would love to say I get my inspiration from life but most of the time my muse is in quilt magazines and blogs. I love instagram for inspiration, and I love reading blogs too. I get inspiration from blogs and the MQG. Thanks for the opportunity! I am inspired by quilts posted online by quilters from all over the world. And secondly, by the amazing fabrics. I get my inspiration from reading blogs and seeing all of the awesome quilts that people make. Thanks! Great givewaway! I get inspiration from books, blogs, and IG! I get inspired by blogs! I read a lot of blogs and spend way too much time on Pinterest. Thanks! 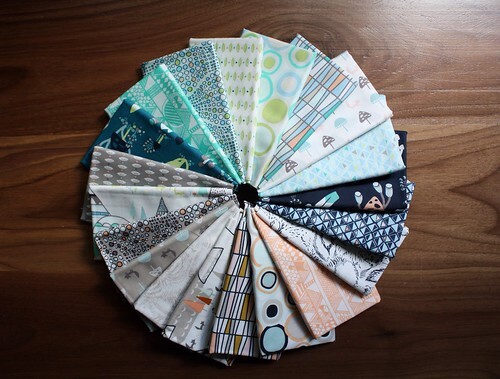 Beautiful fabric collection, and I love Megan Nielson's designs! I get most of my crafty inspiration from blogs, and some from Pinterest. I get inspiration from all around me, but checking out the internets is very rewarding too! I think the hardest part is trying to remove myself away from all the awesome blogs and websites to actually put the inspiration into action! I get my inspiration from blogs, Pinterest, Flickr and magazines. Love those fabrics! Thanks for the chance to win. Just discovered your blog site and enjoy reading it...bookmarked it. Ah, Indian Summer is one of my favorite lines! I mostly get my crafty inspiration from blogs. Thanks! I get the majority of my inspiration from Pinterest and always look for new people to follow on it. Oh - lovely fabric!! Hmm...my inspiration is coming from pinterst these days! Thanks for the chance to win! I love reading blogs for inspiration. Love Indian Summer - I get inspiration from IG. Thanks for the chance to win! I get inspiration from the blogs I visit. I get most of my inspiration from blogs, i follow about a million of them. I also get plenty of inspiration from instagram. Thanks for the giveaway! Most of my inspiration comes from historical or literary things. Thanks so much for the generous giveaway! I'm often inspired by fabric and nature. Oh my gosh! I'd love a bundle of this collection. I find that I get a lot on inspiration from the things around me. I also love being able to be a part of this online community and all of the inspiring work people create! I get my inspiration mainly from blogs and quilting books at B&N! Thanks for the generous opportunity! I usually get inspired by the fabric or by some color combination I happen to see somewhere. I follow you on BlogLovin. LOVE Indian Summer! I get my inspiration from Pinterest and quilting blogs. oh my gosh, I love Indian summer!! I get my inspiration from blogs I follow and also my kids! My inspiration comes from my guild members and friends, and from what I see on Pinterest, Instagram (where I saw your post! ), blogs, books and magazines. So, pretty much anywhere. Beautiful fabric. The fabric gives a lot of inspiration. I find inspiraton all over the place. in nature, other blogs, sculptures,etc. My inspiration comes from within. I know that sounds weird and cheesy, but I end up crafting or doing something artistic when I have a drive to do it. Otherwise, music is quite inspirational to me. I get inspired at the fabric store! Oh that fabric is gorgeous! I get a lot of inspiration from Flickr and Pinterest. I get inspired by all of the wonderful blogs. Thank you for the chance to win. Matsche.christine@yahoo.com. My inspiration comes for blogs. So many out there with so many ideas and ways and creations. My inspiration comes mostly from pinterest and following a lot of beautiful blogs. I get a lot of my inspiration all the crafty peeps in Instagram, from Pinterest, and from pictures or artwork. 💕 thanks for holding the giveaway! My inspiration definitely comes from all over the web when I see what others are up to. I get my inspiration through blogs, books, and even the fabric. I live rurally - at least an hour away from a decent size town. That said - I get a lots of my inspiration from the internet -and- from the natural settings of our beautiful open land. Posted on Instagram as well. I fet inspiration from instagram and flikr. i get my inspiration from whomever i am making for. I love wasting enormous amounts of time on Pinterest- from DIY to sewing patterns. I get my inspiration from other blogs, the world around, and the people that I make the quilts for. Thanks for the giveaway. Pinterest would have to be my top inspiration! I use blogs I love and pinterest for inspiration. I get my inspiration from everywhere: blogs, books, even the grocery store. That's an awesome bundle, and a pretty dress. Thanks for the great giveaway. You can find my blog at ZippyQuilts.wordpress.com, where you can subscribe by e-mail. Thanks! My crafty inspiration comes from my spirited daughters. Thanks. I have been lusting after Indian Summer for some time now!!! Lately I'm getting a lot of inspiration from nature - things are blooming away in my garden and the colors and shapes give me tons of ideas. I get my inspiration from a variety of places. I just keep my eyes open for neat patterns, great color combos and new ideas. Pinterest, and blogs are great for springboarding ideas. I love that fabric line. I get inspiration for colors, designs, and quilting patterns from literally everwhere I look. Mainly from blogs & Pinterest...thanks for a chance to win! Inspiration comes from blogs and fabric. My crafty inspiration comes in a lot of ways, images, the world around me, fabrics, but most especially my 4 girls. My family, friends and garden.....and you! I get my crafty inspiration from all the lovely blogs I follow and pinterest (of course)! Inspiration comes from many places, family, nature and of course, the interwebs! I get my inspiration from the seasons! I get my inspirations from things I need! And from fabric patterns! Sometimes they just really want to make you create something! I am inspired by blogs and instagram! 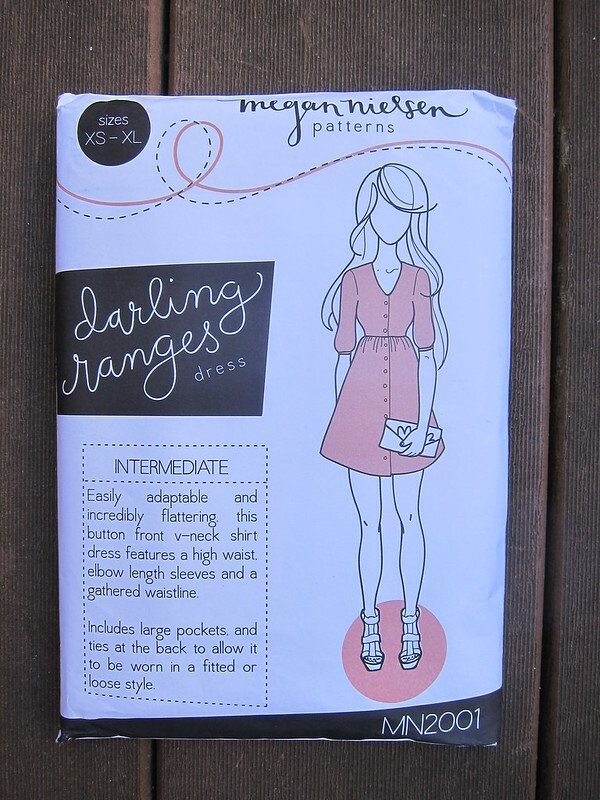 I've really been wanting to try Megan Nielsen patterns. In my opinion there isn't a better source of inspiration than other bloggers. Thanks for the great giveaway. I've no idea where my crafty inspiration comes from, I guess it's in everything I see and do, I do love seeing what others create so maybe that is my answer! I get my crafty inspiration from last minute panic! :) Thanks for the chance to win! Love those prints! I get a lot of inspiration from patterns I see in every day life. Be it architecture, nature or even wallpaper. Very pretty prints! I get inspiration from magazines and quilt shop samples. I'm not very creative or original, but if I see something I like, it gets my creative juices going :-) Thanks for the giveaway! .....and I follow you on bloglovin! I get a lot of it from my daughter. Living at her pace can be so rewarding! I get a lot of my inspiration from Pinterest and other quilters. Beautiful fabrics often come up with their own ideas too. I'm a new follower (via Feedly). I usually inspired through our needs and fabric. Looking at fabric, checking out pinterest and following crafty peeps on instagram usually inspires me! Inspiration comes from all the amazing creative people around me, irl and on the old internets ;) Thanks for the generous giveaway! Shared your awesome giveaway on IG! I get my inspiration from Pinterest and all the wonderful bloggers out there like YOU. Couldn't learn as much as I do without the bloggers!! Blogs helped me renew my interest in quilts. So many creative women & men! Thanks for offering this giveaway…. I love getting inspiration from other blogs. Fabulous giveaway prizes -- thank you! I rely on blogs and Flickr for my inspiration:) Cheers! Inspired by blogs and Pinterest. I am most inspired from blogs. thanks. I get my craft inspiration from the blogs I follow, and just about everything around me. I've really started noticing different colour combinations when people watching. Maybe their bag, or backpack, their jacket, their skirt. Something draws me in, and I start thinking about what I have in my stash in those colours. I get all my inspiration from the internet! I am not very creative on my own, but I like to work off of other's works. I get most of my crafty inspiration from Ravelry (I knit more often than I sew), but I'm also inspired by blogs and by nature. I feel like I get my inspiration everywhere! Pinterest, blogs, IG and magazines are main sources, but any time I see a great pattern or color scheme while I'm out and about I try to take a photo to jog my memory later. I browse online RTW shops for inspiration for my kids' clothing. I adore Indian Summer! I get inspiration from all the great blogs I follow! My inspiration mostly comes from the blogs I follow and a little from my local modern quilt guild! I read blogs to get my inspiration -- but sometimes I find I spend too much time at the computer and not enough at the sewing machine. Indian Summer is such a pretty bundle!! I get my inspiration from amazing bloggers, pinterest (of course), art/nature and magazines/quilt books. a lot of ideas are still coming from books, but also from flickr and blogs ... but yeah if it comes down to it reading a book is somehow more inspiering to me thn the internet. I love the Indian Summer fabrics! thanks for the offer. it seems like I don't have to look far for inspiration these days. sure, looking at blogs helps add fuel to the fire, but I've been feeling like I am walking about the world while being bombarded with inspiring shapes and designs. My inspiration comes from blogs like yours, mags, books, other creative spirits! I just graduated from a Design college program and I have been keeping a notebook filled with stitchy inspiration for after graduation. I am ready to get at it because my new job does not start until June. I like looking at people's stuff to get my inspiration and pinterest!! I love the softness of Indian Summer. I find inspiration everywhere! I know that sounds silly, but it's true. It can be the lines on a rundown building, or the colours of the sunset over the lake in the evening. How can you look around and NOT be inspired? My inspiration is really driven by past generations who have quilted and sewn in my family. Just carrying that tradition on within my family and being able to pass that to my daughters is what drives me. I get a lot of inspiration online--so many creative sharing peeps out there! What a gorgeous bundle of fabric - hope I'm lucky! I am inspired by places that I visit! I recently went to Arizona and found all sorts of quilty inspiration there! I get my inspiration from scanning numerous quilting blogs. Thanks for the chance! Thanks for the tutorials. Most of my inspiration is internet based.